This post was originally going to be about Occult Inspectors but if we gave anything away that’d ruin the fun, wouldn’t it. So why not come down to the pub for a pint? By which I mean, we’ve been doing some iteration of the Public House (and related buildings, and games systems) and, while the trajectory we’ve set upon ourselves here is not yet finished, some interesting bits of design have come up on the path thus far traveled. By which I mean I’ll ramble about random stuff vaguely related to implementing Pub features which may or may not change. First, from the bottom, we see the usual building hipoints, the quality level, and an upkeep display. (Not, mind you, updated to reflect the removal of basic chair upkeep in 53A.) This was added to all buildings in 53A and provides information on exactly how much upkeep is required and when it will be needed. Let’see, the top is the normal zoom-to, building title, workcrew assignment, and demolish button. Nothing new there. Below that, the workcrew shift widget. Okay, the main Pub window contents: At the top, in red, a series of warning can appear telling you why your Pub is not doing what you expect. This was a very old UI idea we’ve had in mind for a while but never quite implemented until Daniel added the ability for empty strings, “”, to take zero space in the UI layout. This means that we can effectively add and remove text without leaving an awkward blank spot in the UI when the text is blank. (This is, for instance, how we were able to implement the amenity TODO list in houses to show what you needed to do upgrades and what upgrades you had already accomplished.) So a subtle tweak of how the UI system handled a certain case let us start adding a lot of helpful information for relatively little effort. A pub under-construction with a longer list of demands. Then there’s booze selection – the details of which are open to change, mind you. 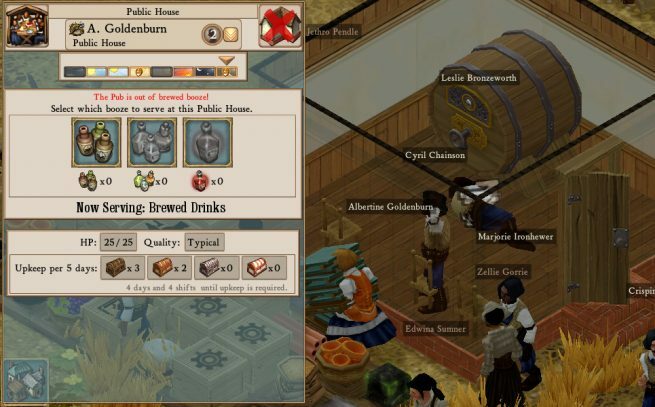 Previously, the Pub would only serve brewed booze and it would always turn into a beer mug when being drunk by a colonist. Now you can select what level of booze you wish to serve with correspondingly greater effect as you move up in potency, and the booze loaded in to the Pub will look the same when coming out. So, for instance, if you load in 3 bottles of whisky and 1 bottle of vodka, that’s what colonists will pull out and drink. 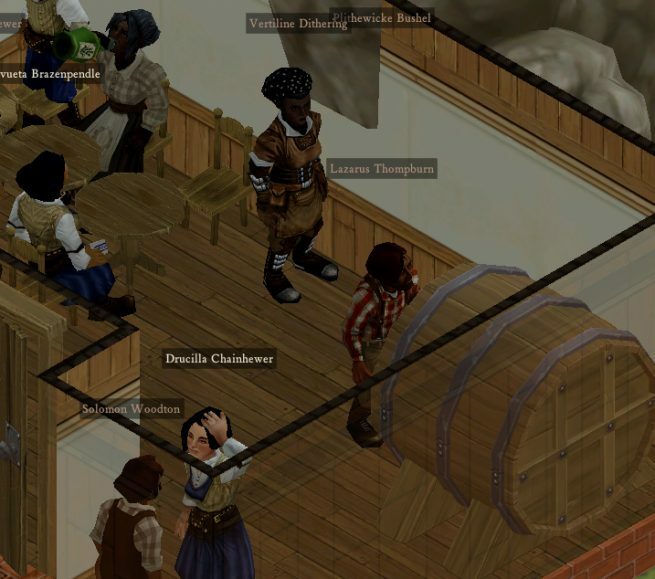 Oh, the other thing: Colonists are now able to self-serve their booze. Coordinating actions between characters is always complex and it’s easy to frustratingly overwhelm the capacity of the Pub workcrew with demand spikes. And while it is possible and even fascinating to write a system wherein Pub workcrews may prioritize stocking jobs vs. serving jobs based on anticipated demand per workshift, I think our development priorities are best served elsewhere. See also: “bruising the fat”. What else? Oh, having a drink at the Pub positively affects a colonist’s Quality of Life because it is considered a Proper and Civilized act (blog post on the concept of QoL here). There’s also a whole discussion there about how to better express the conditions which affect the QoL system which we ought not get into just yet, but will be pretty great. You can even see the start of this particular imperative in the new colonist tooltips. 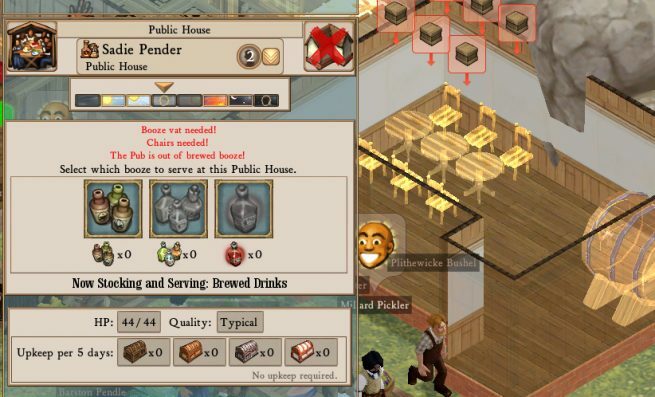 There’s a bit more we have in mind for the Public House, but this should give you an idea of how a few simple enhancements both draws on and affects many other systems working within the game. The Chapel, the other “make people happier” building, will also get some upgrades along these lines to become a bit easier, more expressive, and more interesting. 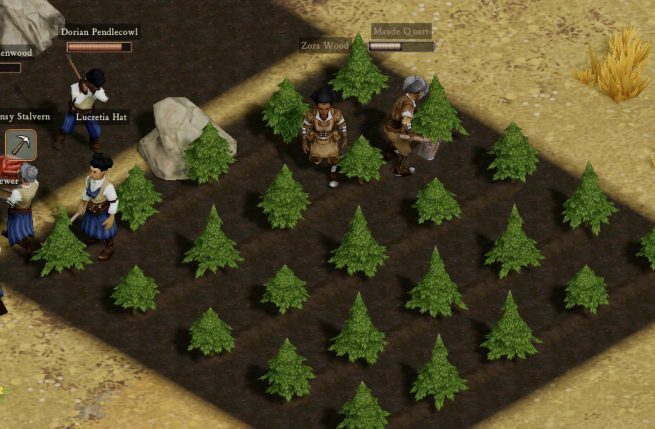 Does this last screenshot imply we can finally engage in sustainable logging? Hipoints, the amount of points a building has for accepting/greeting new users of said building. Besides that, golly. Nothing beats booze. Time to make everyone dead drunk like that Rimworld scenario and watch it all go to heck! Nothing beats the irony of having drunks break the brewery. Suggestion for you guys; sulfur tonic/laudanum could be also implemented for the barber shop, considering it is the go-to place for healing. Have the booze tanks be a module for it! As it is its very plain with having only a chair to give treatment. You could shift the work style from the pub server to the barber so he serves colonists/treats them.